Double-click on the FindAWF.exe file to run it. It will open a command prompt and ask you to "Press any key to continue". You will be presented with a Menu. Press 3, then press Enter. A Notepad document FindAWF.txt will appear with instructions to click below the line and paste the list of folders to be removed. Right click below this line and select Paste, to paste the list of folders copied to the clipboard earlier. Save and close the document. It may take a few minutes to complete so be patient. 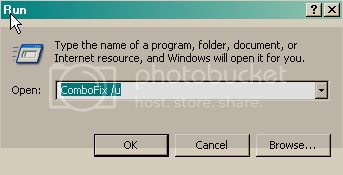 When it is complete, it will open a text file in notepad called AWF.txt. Please copy and paste the contents of the AWF.txt file in your next reply. Edited by Jaereloaded, 24 February 2008 - 05:49 PM. Make sure that you paste the following file paths under the yellow bar within the OTMoveit2 program or it will not work correctly. Post back with a new Hijackthis log and the OTMove it 2 log and let me know how it is running? Registry key hkey_local_machine\software\classes\adm4.adm4\\ deleted successfully. Registry key hkey_classes_root\adm4.adm4.1\\ not found. Registry key hkey_classes_root\adm4.adm4\\ not found. Registry key hkey_classes_root\adm25.adm25.1\\ not found. Registry key hkey_local_machine\software\classes\appid\adm.exe\\ deleted successfully. Registry key hkey_local_machine\software\classes\appid\altnet signing module.exe\\ deleted successfully. Registry key hkey_classes_root\appid\adm.exe\\ not found. Registry key hkey_local_machine\software\classes\adm25.adm25\\ deleted successfully. Registry key hkey_classes_root\adm25.adm25\\ not found. Registry key hkey_local_machine\software\sacc\\ deleted successfully. c:\documents and settings\jamael\local settings\temporary internet files\Ssk.log moved successfully. Registry key hkey_current_user\software\need2find\\ deleted successfully. Registry key hkey_local_machine\software\need2find\\ not found. Click Privacy in the menu on the left side of the Options window. Click the Clear button located to the right of each option (History, Cookies, Cache). Alternatively, you can clear all information stored while browsing by clicking Clear All. A confirmation dialog box will be shown before clearing the information. After that go to Start >Run and type in Cookies and delete everything that is a .txt file that shows up there. Download the latest version of Java Runtime Environment (JRE) 6 update 3. Also delete\uninstall anything that we used that is left over. I can't thank you enough for all your help. I am still having an issue. I'm trying to add this new Anti-virus software. I keeps saying I don't have sufficient memory to run this program..... but I've deleted almost everything to make room. What could be the problem? You are welcome the problem seems to be that you need some more ram. you have this much :Total Physical Memory: 127 MiB (512 MiB recommended). as reported by the Deckard system scanner. 128 mb's is very little and because antivirus programs run in the ackground they use a lot of ram.